17th July 2013: Streaming video and rights! Our post above on LinkedIn & Facebook yesterday and subsequent recent Twitter activity may help promote a long needed discussion on streaming video in Australia! Lets hope we get an Australian division of the major players or even some Australian born players soon! 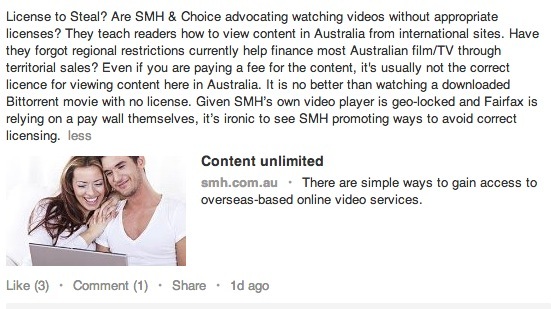 Then Australians can purchase access with ease and not have to worry about whether its right, legal or stealing! At ScreenLaunch we focus on financing and innovative digital forms of sales, distribution and production. ScreenLaunch works with clients from concept to launch by assisting with digital strategies, finance, production and sales. We offer new methods of community distribution, streamlining revenue returns and maximising audience exposure.